Multichannel audio playback for theme parks, interactive tourist attractions, museums, cruise ships, amusement centers, resort parks, public spaces, music backing tracks for concerts and tours, stems for church worship teams, mobile production units, and broadcast TV trucks. RADAR systems purpose-designed to run audio, and are rock-solid, designed to play glitch-free audio all day long. Rugged Rack Mount designs also make for easy installation. Simple but flexible: route multiple channels of audio to multiple output locations, each with independent triggering. Other multichannel playback systems require all channels to play simultaneously but RADAR allows any channel of audio to run completely independent of the others. RADAR integrates well with other systems, whether audio interfaces or remote control systems. When connected to other control systems you can operate RADAR from touch panels, wall switches, motion sensors, or wireless tablet. Integration also allows audio tracks to be synchronized to other systems such as lighting or machine control. Turn it on. Hit Play. Dead simple. 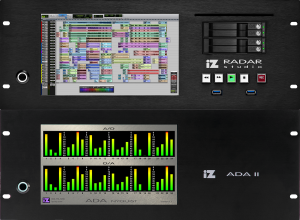 RADAR software allows powerful and flexible configuration to meet the needs of the most demanding audio engineer and system integrator. But simple playback control is available for untrained users whether from the front panel or from an automated control system.